Participants donned umbrellas and smiles as they completed the loop around the Alaska Native Health Campus. Southcentral Foundation President/CEO Dr. Katherine Gottlieb, employees, customer-owners, and community members gathered for the third annual Prayer Walk on Sept. 5. The event is designed to uplift Alaska Native people and the leaders of our great state through prayer. 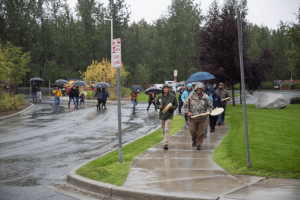 Rainy conditions did not stop participants from actively participating in the walk around the Alaska Native Health Campus. The event started in the Tribal Drum at the Nuka Learning and Wellness Center. In the Drum, participants gathered to hear information regarding the event, take part in prayer, and learn more about the community partners that were in attendance. Then, members of the Christian Motorcyclists Association started the prayer walk by riding their motorcycles around campus, followed by the rest of the attendees. Once the group returned from the walk, they were treated to a performance by the Princess Warriors and a meal. Thank you to all who were in attendance. SCF hopes to see even more members of the community at next year’s annual Prayer Walk.